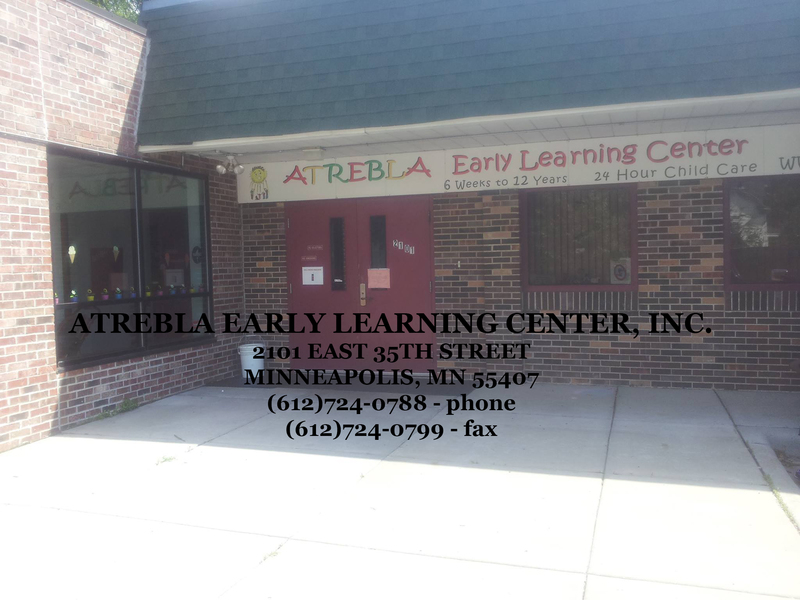 Atrebla Early Learning Center, Inc.
Atrebla Early Learning Center, Inc. in Minneapolis, MN provides childcare on a drop-in, full-time, or part-time basis with overnight care for children ages 6 weeks to 12 years old. Whether you work first, second, or third shift, we provide childcare to meet your schedule. We focus on preparing children academically to enhance readiness for entrance and involvement in school. Children are served two full hot meals, plus nutritious snacks. Field trips and special in-house programs, such as Storytelling, Spanish lessons, Dance, along with other recreational learning activities are provided to enhance learning for all ages. Atrebla Early Learning Center, Inc., located in Minneapolis, is licensed by the State of Minnesota Department of Human Services. The Center is dedicated to providing early childhood education and quality childcare services for children ages 6 weeks to 12 years old. The Center is a place where young children can enjoy learning while having fun. Our Center is open 24 hours every day. We are closed for all major holidays. Our mission is to promote learning readiness by providing a safe, secure, and friendly environment. This is accomplished by promoting the physical, social, emotional, and intellectual growth of the children we serve. Our vision is clear and simply stated: educating children. By holding this simple statement as our vision, we are able to create a curriculum which prepares our infants to become toddlers; toddlers for preschool; prepares our preschooler for kindergarten; and enhances our school-agers academic experience by contributing to youth development in art, math, music, science, and reading. Please contact us for more information about registration. Atrebla.com has created this privacy statement in order to demonstrate our firm commitment to privacy. The following discloses the information gathering and dissemination practices for this website. This site contains links to other sites. We are not responsible for the privacy practices or the content of such websites. Your information stays private.